We hope that you have enjoyed our play through of Breakout and our first installment of House Of Madness. We’ve had a blast writing and playing House of Madness, and the adventure is just gaining momentum; I for one can’t wait to see the story unfold. We’ve been doing the PBEM for over a year now, and for various reasons many of the original players are having to bow out for personal reasons. As the number of players dwindle, that leaves me in a tight spot. I really want to release the House Of Madness Event Book as fully play-tested. So I’m looking for two to three good players. Any new player must commit to posting at least once per week. They must choose a character not played by a previous player (though Daredevil, Iron Man, Ms. Marvel, and Red Norvell were all NPCs and are open for use). Please have a backstory ready as to why your chosen hero wants to join the Fearsome Avengers. Also, our game will continue to be posted to Plot Points at intervals, so players must consent to having their in-game posts displayed as part of our Plot Points in-game content. Players should get up to speed on the current continuity by reading our prior posts for Breakout and House Of Madness Act One Part One. We also encourage you to read Avenging Arach-Knight 1-4 to get some background on that character, since he’s not entirely mainstream Marvel, though that reading is not required. Remember when choosing your characters that this game is set just after Breakout, and takes the place of Marvel’s House of M. Events like Civil War, Secret Invasion, Avengers Vs. X-Men, etc., have not yet occurred (and might not occur), so characters introduced in those stories are probably not available, or if they are will have to have their origin stories redeveloped. Original characters created by the player are subject to Watcher approval, though a retooling of an established but generally unknown Marvel character will probably be ok (Arach-Knight is a good example of this) as is the reworking of a reformed villain into a potential hero (as was done with Crusader), though I’ll keep the latter at a minimum, as the team already has two probationary members in Crusader and Morbius. Also keep in mind that this is supposed to be the Fearsome Avengers, so try to choose characters that fit that darker, more terrifying image. Posting guidelines will be explained to the players once they have been accepted into the group. We will use Google Groups for our game posting medium – the group will be separate from the one used by the Plot Points Bullpen. Interested players should reply in the comments below or send me an e-mail directly (see our Contact Us page). Submissions will be taken up to one week after this post goes live or until all open slots are filled. I will add a note to this post once submissions for new players are closed. NO FURTHER SUBMISSIONS – SELECTION PROCESS CLOSED. Selected players will be contacted individually by no later than Friday, July 8th. 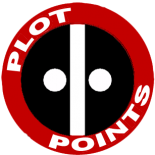 Thanks to all for your interest and continued support of Plot Points. Shane, our game is PBEM, and we generally do our posting during the week. If you are still interested let us know the character you wish to play and your character’s Hook (how you are integrating the character into the existing story). Just a note in case you aren’t caught up with the game so far, I think Professor X died a little while ago. Maybe that’s driven Sentry to a little bit of revenge then? Or if you want him to still have a therapist, maybe it’s Emma Frost instead? Although given how messed up she is, she might be more harm than help. Excellent. Let us know what character you want to play and that character’s Hook. I’ll be making final player selections on Tuesday. Sure. I won’t make final player selections until Tuesday the 5th. Please send us your choice of character and Hook before then. I sent an email to jpjolin a few hours ago expressing my interest. Hopefully he got it. I am interested in joining. I will send an e-mail soon. I am so interested in this. Are there any places still open? Yes, I won’t make my final player selections until Monday (really, Tuesday, since Monday I now see is July 4th). Per below, and per the info in the original post, if you are still interested reply by then with the character you want to play and that character’s Hook. Just to be clear to everyone whom is interested in playing the game, I’ll review all entries and make final determinations next Monday. If you are interested please make sure you tell us what character you wish to play and how you will integrate that character into the current story (your character’s Hook). Some of you have done this already, so thank you. Darn it. I missed the deadline. I was ready to play Cable, Luke Cage, Captain America, Wasp, or Thor. This entry was posted on June 27, 2016 by jpjolin in Actual Play.